Music City Food + Wine Festival is the brainchild of Grammy award-winning artists (and Nashville residents) Kings of Leon, world renowned chef Jonathan Waxman, Austin-based C3 Presents — producer of Austin Food + Wine Festival, Austin City Limits Music Festival, and Lollapalooza — and Vector Management’s Ken Levitan and Andy Mendelsohn. 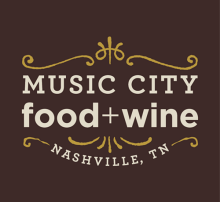 Taking place in the historic venues and outdoor spaces of downtown Nashville, Music City Food + Wine is an authentic, fresh and inspiring experience that will have even the most discriminating gourmet coming back for more. Gather at historic outside venues in downtown Nashville for national, regional and local chefs for a weekend of gastronomic revelry including local bites, chef demos, wine & spirit tastings and live music.